The Acer Chromebook 11 offers just enough features and performance needed for work and play, and nothing extra. 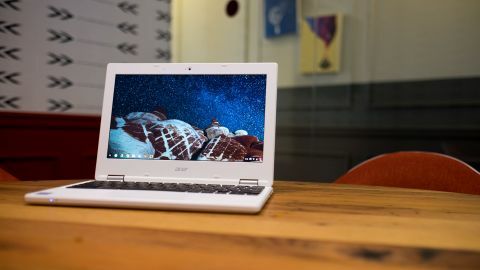 The Acer Chromebook 11 is the non-convertible version of the Acer Chromebook R11, giving you everything you need from a Chromebook, with new gimmicks. You’re getting a long-lasting battery, a compact and light design, reliable performance and a super low price of $179 (£199, AU$329). Acer has found a way to make something that looks so plain stand out. The Acer Chromebook 11 has a beautiful white exterior decorated with a micro-diamond pattern etched into its cover for extra grip. It really pops on any non-white surface, especially with its two aluminum hinges. While the plastic casing might feel cheap at first, the notebook’s underlying performance helps you look past it. Its 2.16GHz Intel Celeron processor and 16GB of internal storage give you just enough power and room to work with multiple web pages open at any given moment. Meanwhile, the Acer's 11.6-inch, matte screen has wide viewing angles and no noticeable glare. The 1,366 x 768 resolution display is ideal for working in both indoor and outdoor settings, all while making web pages and streaming video look nice and crisp. Other features include a single USB 3.0 port, one USB 2.0 port, an SD card reader, and an HDMI. The compact Chromebook keyboard takes some getting used to, especially if you're used to using a standard full-sized keyboard on a PC. Without the little niceties like backlit keys, it was a pain to use the computer in the dark while viewing movies. Most of the time, browsing the internet goes smoothly, with responsive "Ok Google" voice searches and Chrome apps. However, with only 2GB of memory on tap, performance can also take a sudden nosedive when watching a few YouTube videos with a few other tabs open for music, email and web browsing. The downward facing speakers are more powerful than you might think, but the bass is pretty weak. They're best used atop a hard, flat surface to bounce the sound off of. Thankfully, the Chromebook has a set of side vents that allow sound to stream out, even if you have the laptop resting on soft surfaces, like your lap. Overall the audio experience of the Chromebook is decent and you can comfortably hear videos and music, without necessarily having to use headphones or a Bluetooth speaker.